In the true spirit of every ex-girl guide, she was prepared for all eventualities and was sporting her entire makeup trolley and armfuls of tops and jumpers. The temptation for makeup artists can often be to wear makeup that’s a bit “out there”, just to show what they can do, but Jo decided that people need to see her as she really is, and how she would be if you met her in an everyday work situation. I am very much in favour of this principle for professional headshots. It seems pointless posting an image (on LinkedIn for example) that doesn’t reflect your usual day to day business persona. Of course, we also had a bit of fun trying a few alternative makeup ‘looks’, but in the end, Jo chose the photos that are more representative of what she normally wears to work. Jo had lots of ideas and gave me some tips to pass on to people for when they are preparing for their own professional headshots, which I look forward to reading about on her blog over the coming months. She has had an interesting career path and here is a transcript of my “interview with a makeup artist” …. BP:- So how did you decide that you wanted to be a makeup artist, Jo? JW:- I’ve always loved makeup, but never dreamed I’d be able to make a career out of it. In my teens I would spend hours trawling makeup shops, and rush home so that I could try out another new look (not all of them successful!) When I left school, I got my first full time job and although the money seemed great for a bit, I realized you’re a long time working and I needed to find something I was really passionate about. I looked in to all sorts of different options but then I found a course in Leeds for a diploma in Theatrical and Media makeup. That was 8 years ago and I haven’t looked back since! BP:- I love photographing and being part of people’s “Big Day” so I know what a thrill it is to be asked to be involved. What would you say is the best part of doing someone’s wedding makeup? JW:- Working on a wedding is a huge honour. You get to see all kinds of intimate moments – the bridal parties first toast, the lacing of the dress, a father seeing his daughter for the first time – it’s emotional stuff! I get such a buzz knowing I’ve been a part of that and helped my client feel the best they ever have. And I always supply a custom touch up kit, so that my brides can be sure to enjoy their day however they want – happy tears and all! BP:- ……on the other side, what is the hardest part of doing someone’s wedding makeup ? JW:- As wonderful as weddings are, there’s always a lot going on, and usually all sorts of different people popping in and out. Things can change at the last minute, which means I need to be able to adapt to that whilst still having timings in my head. I like to make sure my bride has enough time for a breather before she leaves, so no matter what’s going on around me I need to be quick on my feet with changes to make sure she gets that! BP:- If someone is getting married and thinking about doing their own hair and makeup, what advice would you give them? BP:- You said at the beginning of the photo session that you have never done a studio photo session like this, and that you are usually taking the photos! Do you think your expectations and the reality were the same? JW:- Completely different! When I work on photo shoots I’m always watching behind the scenes and the models make everything look effortless, I just thought I’d look silly! Actually, in reality, I really enjoyed it! You managed to make me feel at ease and nothing about the morning seemed forced. I was so pleased with all of my photos – and that’s a rarity for me! Thanks Jo! I’m delighted you had a great, relaxed experience and that you’re excited to upload your own headshot. I look forward to seeing it! 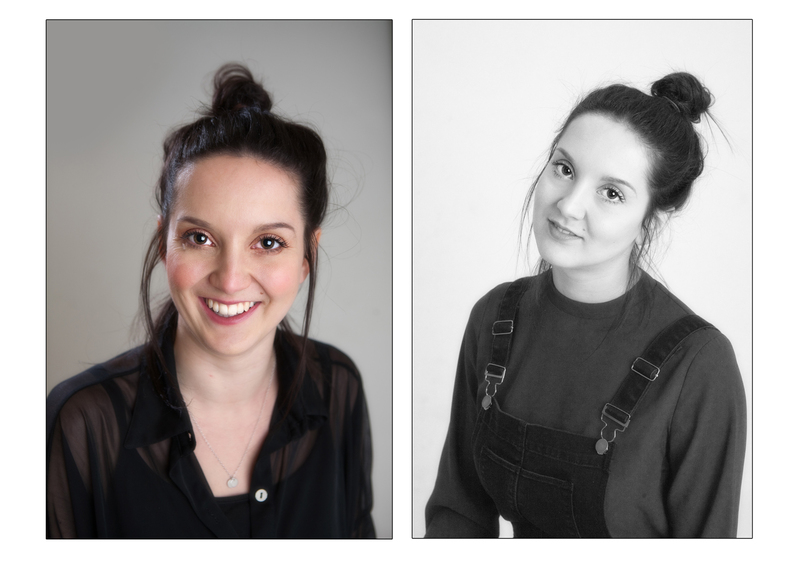 If you would like to book your own headshot photo session, please phone or EMAIL me to arrange a good time.